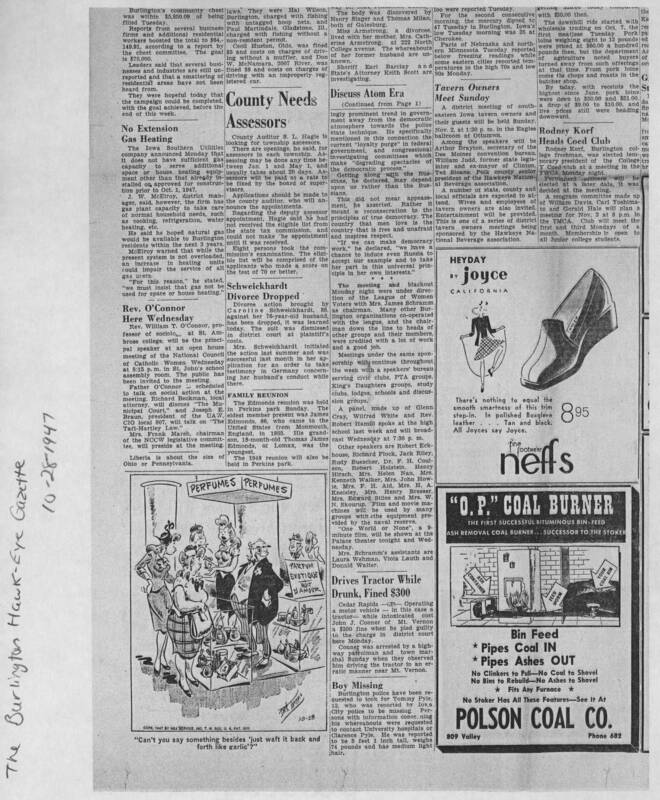 The Burlington Hawk-Eye Gazette 10-28 1947 Discuss Atom Era (Continued from Page 1) ingly prominent trend in government away from the democratic atmosphere towards the police state technique. He specifically mentioned in this connection the current "loyalty purge" in federal government, and congressional investigating committees which make "degrading spectacles of the demographic process." Getting along with the Russians, he declared, may depend upon us rather than the Russians. This did not mear appeasement, he asserted. Rather it meant a reconsecration to the principles of true democracy. The country that men love is the country that is free and unafraid and inspires respect. "If we can make democracy work," he declared, "we have a chance to induce even Russia to accept our example and ot take her part in this universal principle in her own interests." The meeting and blackout Monday night were under direction of the League of Women Voters with Mrs. James Schramm as chairman. Many other Burlington organizations co-operated with the league, and the chairman down the line to heads of other groups and their members, were credited with a lot of work and a good job. Meetings under the same sponsorship will continue throughout the week with a speakers' bureau serving civic clubs, PTA groups, King's Daughters groups, study clubs, lodges, schools and discussion groups. A panel, made up of Glenn Cray, Wilfred White and Rev. Robert Hamill spoke at the high school last week and will broadcast Wednesday at 7:30 p. m. Other speakers are Robert Eckhouse, Richard Plock, Jack Riley, Rudy Buescher, Dr. F. H. Coulson, Robert Holstein, Henry Hirsch, Mrs. Helen Nau, Mrs. Kenneth Walker, Mrs. John Howie, Mrs. F. H. Aid, Mrs. H. A. Kneisley, Mrs. Henry Bresser, Mrs. Edward Stiles and Mrs. W. N. Skourup. Film and movie machines will be used by many groups with the equipment provided by the naval reserve. "one World or None", a 9-minute film, will be shown at the Palace theater tonight and Wednesday. Mrs. Schramm's assistants are Laura Wehman, Viola Lauth and Donald Walter.